Rafael Sabatini was born April 29, 1875 in what was then the small town of Jesi, Italy, which is near the Adriatic and the seaport of Ancona. Today, Jesi is basically a suburb of Ancona. From the sketchy evidence I have been able to gather, it appears that Rafael was illegitimate. It is interesting to observe that from the very beginning of his life, there were matters that would provide literary fodder for the romancer for the rest of his life. For instance, the town of Jesi is part of the territory Cesare Borgia carved out of Italy for himself. The illegitimacy of Cesare Borgia too must have appealed to Sabatini. He would ultimately write more than half a dozen books on the Italian figure and his era. The idea of illegitimacy also plays a prominent part in Sabatini's work. From Scaramouche to The Lion's Skin to The Tavern Knight, as well as several other works, illegitimacy is a key element in each of these novels. Sabatini's parents were well-known operas singers in their day, travelling around the world. They had met, as performers, in the far-away Philippines. 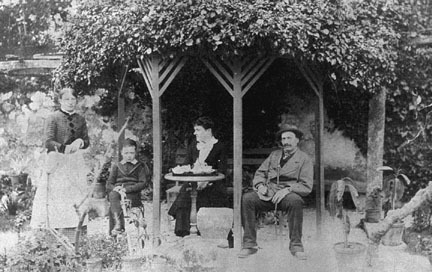 His mother, Anna Trafford, was English from the Liverpool area, and she was an accomplished pianist as well as a singer. Vincenzo Sabatini, Rafael's father, was Italian. The birth of Rafael in Jesi was no accident, since Vincenzo's father also lived there. At some point the couple either married or common law took over, for Rafael's mother never went by any name other that Mrs. Sabatini. Since Rafael's parents were still performing when Rafael was an infant, they likely decided that the itinerant life of an opera singer was ill suited to a child. They sent him to Anna's parents in England to a small village outside Liverpool. Rafael, even as a youngster, was already being exposed to many languages something that would strongly influence the direction of his life in the future. According to John McCormack, the Irish-born tenor, who studied under Rafael's father, Vincenzo spoke only Italian. Anna spoke both Italian and English. However, I would be surprised if Anna's parents spoke anything other than English, so at a very young age, Rafael was already exposed to two languages. It was at this early age that Sabatini began reading voraciously. He once said that the reason he wrote in English was because all the best stories are in English. Certainly as a youngster, he read many books far beyond his years. Also, no doubt it was at this young age that he fell in love with the countryside of the west of England. As an adult he went to the borderland between Wales and England as often as he could until, finally, in his 50s, he settled there permanently. When Rafael was about seven, he was called back to the side of his parents. After long and distinguished operatic careers, they had left the stage to pursue careers as singing teachers. Vincenzo especially built a noteworthy career for himself. He was knighted by the King of Portugal for his work as a teacher, and, as stated earlier, the famous singer as John McCormack studied with him. The Sabatinis moved to Porto, Portugal to open their first school, so Rafael was able to add Portuguese as a third language to his linguistic repertoire. Rafael attended a Catholic school there. This may have been the beginning of two other of Sabatini's lifelong passionsthe demand for justice, whether it was for Cesare Borgia or Captain Blood, and the desire for tolerance, from such novels as The Hounds of God to The Sword of Islam. A few years later the Sabatinis returned to Italy, this time Milan. No doubt being close to a famous opera house was good for business. At this point, Rafael was sent to a school in Switzerland. In case you're wondering, it wasn't abnormal in the 19th century to send children away to school. Middle and upper class parents wanted to get the best education they could for their children. So off Rafael went to Zug. In Switzerland, Rafael added French and German to his linguistic arsenal. Indeed, in later years, he mentioned that his first forays into writing were in French at this Swiss school! Rafael spent his teenage years in Switzerland. This was another country he would often return to as an adult. During this time, Sabatini continued his voracious reading. In later years, he talked about reading Shakespeare (for the stories) and Dumas and Manzoni and Jules Verne and Scott. He was especially enamoured with William Prescott, the American historian. Prescott wrote such books as History of the Conquest of Mexico and History of the Conquest of Peru. In later years Sabatini admitted to daydreaming that he himself was Pizzaro. Surely such reading was an outstanding education for the future romancer. At the age of seventeen, Sabatini left school to begin practical life, as his diploma so picturesquely puts it. His father had decided that Rafael's considerable linguistic attainments would find ready employment and a bright future in that most international of commercial worldsmighty Great Britain with its colonies and trade around the world. Vincenzo decided to send Rafael to Liverpool. First, because Anna had family in the area who would watch over the lad and guide him into commerce. But second, because Liverpool was the largest port in England and would provide many opportunities for employment. Rafael arrived in Liverpool in 1892. Brushing up on his rusty English, for several years Rafael applied himself assiduously to business. He worked as a translator, especially for the Brazilian trade which could use his fluent Portuguese translating and writing letters. About 1895 or 6, it appears, he began to write romances because, so he said, it was more fun to write them than read them. In one of his biographical articles, the writer talked about how the will to write romances was early astir in him. He probably began to write in English as soon as he felt fully competent to do so. According to Sabatini, he was talking with a reporter one day when Rafael reluctantly (one wonders how reluctantly!) admitted that he was writing short stories himself. The reporter asked to see them, liked them, and submitted them to an editor, who apparently liked them well enough to buy them. Those early stories have been lost sofar, at least but they were probably published in a local Liverpool newspaper or magazine. Sabatini quickly advanced to the better paying markets. By 1899 Rafael was selling his short fiction to first class national magazines like Pearson's Magazine, London Magazine, and Royal Magazine. Those years from about 1895 until about 1905 were very trying for the young man. He was holding down a full time job and trying to write full time on the side as well. He said he felt he got as little sleep as any man in England during that time. However, his efforts paid off. In 1901 he got a contract to write a novel, without ever having written one before. In 1905 his second book appeared, and he quit his job in the business world to devote himself full time to writing. 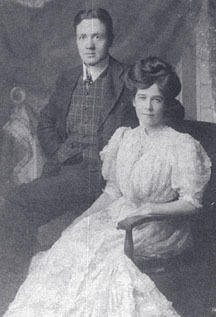 It was also in 1905 that Rafael married Ruth Goad Dixon, one of the daughters of the well-to-do Liverpool paper merchant Lancelot Steele Dixon. The Sabatinis moved near London, so that Rafael could be near the publishing world. In 1909 they had a child Rafael-Angelo, who they nicknamed Binkie. From then on, he was called Binkie by friends and relatives. Once he devoted himself to writing full-time, Rafael produced a book a year. In addition, he was an active short story writer. Through the years he built a loyal but not necessarily large readership. By the decade of the 1910s he was producing some fine work, including The Justice of the Duke (1912) and The Banner of the Bull (1915). The Sea Hawk came out in 1915, not to mention the two Historical Nights' Entertainment volumes in 1917 and 1919. During World War I, Sabatini became a British citizen, when he was threatened with conscription by the Italian Army. He worked in British Intelligence as awhat else?translator. His talents in the field, it seems, were exceptional, but his work is still cloaked in secrecy. By 1921 Rafael had been writing for a quarter of a century. He wrote prolifically, and while he was comfortably off, still, his success was somewhat modest. But all that was about to change. In 1921 Scaramouche was published in England, as well as in America, after having been rejected in America by a number of publishers. To everyone's surprise this romance of the French Revolution became an international best seller. Then in 1922 Captain Blood proved an even larger success. The publisher rushed dozens of Sabatini's early titles back into print. At last, Rafael was an overnight success after only 25 years of writing. By 1925 Rafael was wealthy. His books were turned into movies and into plays; there was even talk of an opera based on Scaramouche. The writer was on newsreels and articles on him appeared in newspapers and magazines. Sabatini loved writing, however, and did not slacken his prolific pace of writing at least one book a year. By 1927 Sabatini was exhausted; on the advice of his doctors, he took some time off and rented a house near Tintern Abbey in his beloved countryside on the Wales-England border. There he would relax and do some fishing. Their son Binkie, fresh from crammers, would join them in the new car his indulgent parents had bought him. Rafael and Ruth were preparing to go to Scotland the next daythis was April 1, 1927to see Rafael's stage production of Scaramouche, so they were wrapping up their stay in Brockweir House, the country home they'd rented. Rafael took a friend to the train station in Gloucester, while Ruth and Binkie went for a ride themselves to Monnmouth. On the way back from the train station, Rafael saw a wreck. With a wrenching feeling, he knew it was Binkie's car. Alongside the road was the body of his beloved son, expiring. They took Binkie back to Brockweir House, but it was too late. Their son was dead. Ruth, however, was all right. She was thrown from the car and knocked unconscious, so she mercifully had no recollection of the events. Rafael and Ruth were devastated by the death of their only child. Rafael didn't seem to write much for some time, but what he did write, he said, was like a lifeline in his deep depression. Personal problems continued to mount. Apparently Binkie had been the only thing holding the couple together. 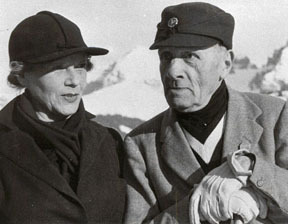 Rafael and Ruth divorced in 1931. They admitted in court that the marriage had been an unhappy one. As if all that weren't enough, it was the beginning of the Great Depression and the sales of Sabatini's books declined dramatically. Partially, to try to coup some of his lost popularity and partially to leave behind the gossip of London, Rafael took a book tour of the United States, the only time he would venture to our shores. Sabatini's house, Clock Mill, where he lived from 1931 until he died. Gradually, Sabatini regained his equilibrium. 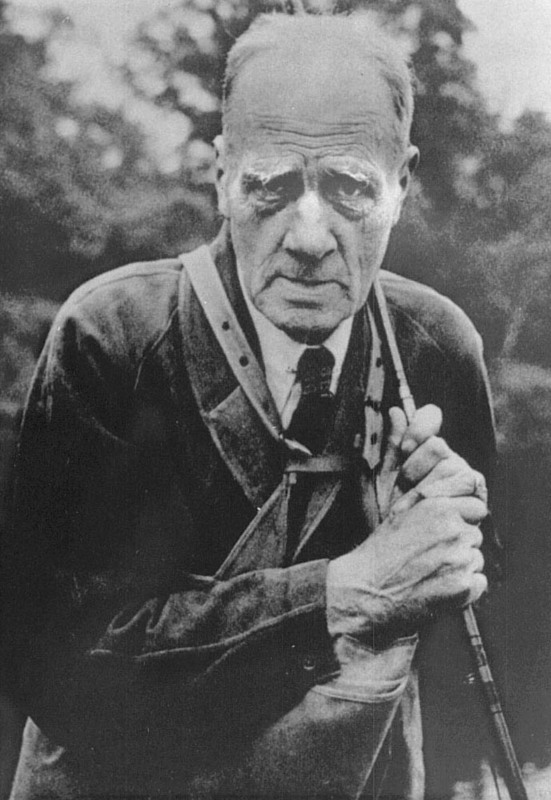 In 1931 he purchased a home on the Wye, the river that marked the border between England and Wales. 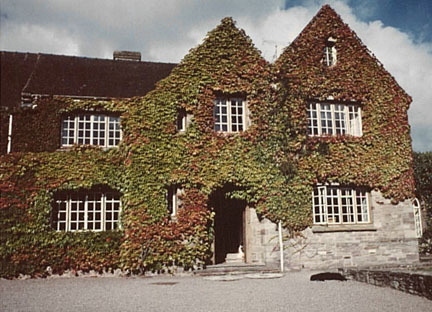 The home, called Clock Mill, was near Hay-on-Wye, that modern mecca for book-buyers. He had the house remodeled, modernized, and enlarged. In addition, he had a stream put in and stocked it with trout, so he could go fishing whenever he chose. Withdrawing from London life, he would live there the rest of his life. In addition, at the age of 60 Rafael remarried in 1935. He married his former sister-in-law, Christine Dixon, a woman who had been married to Ruth's brother. A sculptor of considerable talent her artistic temperament was probably a good fit with Rafael. Rafael's life returned to its placid flow. Besides writing, he had two passions in his life. He loved to fish; that he could do by stepping out his door and indulge himself whenever he liked. 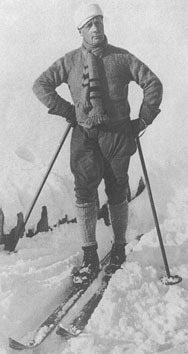 He also loved to ski, and every January, with the exception of war time, Rafael and Christine went to Adelboden, Switzerland. Although perhaps not up to the pinnacle of worksScaramouche, Captain Blood, and The Sea Hawkthe decade of the 30s saw much fine work. He seemed to favor especially the short story form here, writing two volumes of Captain Blood stories, Chivalry (1935), another Historical Nights' Entertainment (1938). A true cosmopolitan, comfortable in most of the capitals of Europe, Sabatini was depressed at the approaching war in the late 1930s. However, the war would strike home in an even more personal manner. Christine had a son, named after the patriarch of the Dixon family, Lancelot Steele Dixon. He was very much like Sabatini's first son, Binkie. He was outgoing, personable, and friendly. His nickname was Lanty. When the war broke out, Lanty joined the RAF and learned how to fly. On the day he got his wings, Lanty flew over Clock Mill. His proud parents were outside, waving at him as Lanty tipped his wings. Then something happenedno one knows quite what. But Lanty's plane went out of control, and the young pilot crashed in flames across the Wye in a field, before the horrified eyes of Christine and Rafael. The senseless tragedy of war had touched even that harmless couple far away from any of the theatres of war, in the green and peaceful countryside. For many years Christine had nightmares about the event. But then one day in Switzerland she saw a blue mountain flower. She took some back home with her and planted them, in the shape of a plane, in the garden of Clock Mill. Perhaps she fantasized that the plane was forever overhead. Whatever, the blue flowers brought some measure of peace to her troubled mother's mind. As the war went on into the 40s Sabatini wrote less. For the first time, he did not adhere to his book-a-year regimen. He was having health problems. His stomach was causing him problems. It appears that he had stomach cancer. Still, he loved to write, and even though his production slowed he nonetheless produced some first-rate work, including The Gamester (1949) His last book, published in 1950, was a collection of short stories, Turbulent Tales, some going back several decades. 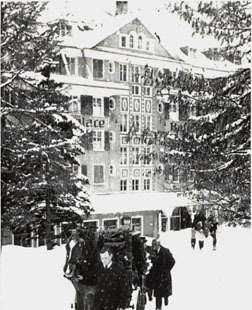 By winter of 1950, when it came time for his annual visit to Switzerland, although gravely ill, Rafael insisted on being taken to his beloved Adelboden, Switzerland. He was so ill he stayed in bed most of the time, barely able to lift a pen. On February 13, 1950 the end came for Rafael Sabatini. He is buried in Adelboden, Switzerland. Christine created a touching sculpture for his gravesite. It shows a man, fallen, face down, pen in hand. When it came time for an inscription, what better quote could she have found than her beloved husband's own words. On his grave is the sentence, He was born with a gift of laughter and a sense that the world was mad. I think that is a fitting way to remember the last, and one of our greatest, romancers. Copyright 1999 Jesse F. Knight. Last updated 17 March 2008. Any concerns or problems about this site, please contact Rimfire.